At Harvard University, Alex is preparing for Supergirl's arrival, including telepathically making people leave the campus and bringing others in. Kara meets Lois at the hospital, where Catherine is... unconscious (I think?) from the shock of seeing her dead child. Lois wants to know what Kara's not telling her. Flash back to Kara and Robin in Gotham, where Kara pulled a Kryptonian sunstone out of one of the drones. Lois shares her files on Cadmus with Kara, who flies off to investigate. In Alex's lab, one of the people he's brought in is revealed to be Miss Martian. She was apparently joining Kara, Robin and Blue Beetle in trying to take down Alex and his FlyOver app as Kara finds the Cadmus lab with a dead Kryptonian inside. 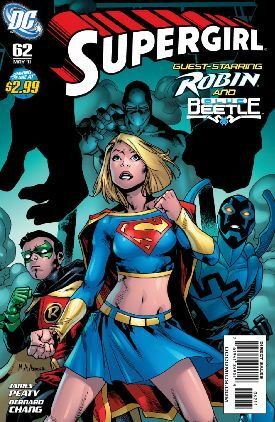 Supergirl returns to Blue Beetle and Robin, they investigate the emptied Harvard, locate Miss Martian and Kara goes barging in. Alex is revealed to be Cadmus' "designer Kryptonian" and knocks Supergirl out. Blue Beetle sets off some kind of sonic charge which seems to disable the drones and Alex's "Father" computer. Story - 3: Things are still moving along nicely, but I knocked this down from 4 due to the sheer confusion I experienced on pages 11-13. On the first read-through, there's nothing at all to indicate that Kara in Cadmus is taking place BEFORE Kara meeting up with Beetle and Robin. So the default reading is that they're happening simultaneously. Since Kara can't be in two places at once, and we're dealing with a mind-controlled shape-shifter in the story (Miss Martian), I figured the Kara with Robin and Beetle was Miss Martian in disguise. This was of course not the case, but that made things really confusing when the not-Miss-Martian-Kara finds the actual Miss Martian. In short, those panels on pages 11-13 should have been differentiated somehow to let the reader know that they weren't happening simultaneously... a different panel border, perhaps, doing them in black and white or something else. It completely interrupted the flow of an otherwise decent issue. I'm also not sure why what caused Catherine to be in the hospital isn't explained, and I actually had to go back two issues and look her up to remember what her name was. It's a bit frustrating that we're given an editorial note about something major from last issue (Supergirl and Robin fighting the drones in Gotham), but not something more obscure from two issues ago. The latter is the kind of thing you actually need an editorial note for, and not the former. That is by no means the fault of the writer, though. Art - 3: I'm still not overly thrilled with the art, as Kara still too often looks like she's modeled after Paris Hilton for my tastes. Although it's odd that she only looks that way in about half the panels, and in the other half she looks quite different. Everyone else in the book seems to be very consistently drawn with their facial features, but Kara seems to have two different faces and I'm never sure which we're going to get. Cover Art - 3: A little bland, but at least Kara looks a little bit older here so I at least give it points for not making her look prepubescent.